Could These Potential Catalysts Drive Lilly Higher? Could these two catalysts breathe some life back into Eli Lilly, which has remained flat over the past 12 months? Investors have plenty of reasons to be bearish on Eli Lilly (NYSE:LLY), which has gone absolutely nowhere over the past 12 months. Several key patent expirations, its costly Alzheimer's failures, and missteps in diabetes and oncology have all allowed companies like Johnson & Johnson (NYSE:JNJ), Novo Nordisk (NYSE:NVO), and Sanofi (NASDAQ:SNY) to gain a competitive edge against Lilly. However, I believe there is still long-term value for Lilly's stock for patient investors. Let's take a closer look at the company's recent quarter and two potential catalysts that could boost its share price in the future. Last quarter, Lilly's adjusted earnings fell 13% year over year to $0.74 per share as revenue slumped 2% to $5.81 billion. However, those lackluster results still topped Wall Street estimates. Sales of the antidepressant Cymbalta, which accounted for over 20% of Lilly's top line in 2013, plunged to $883.2 million in the fourth quarter, 38% lower than fourth quarter 2012. Sales of the drug in the U.S. fell 49% to $577.3 million after it lost patent exclusivity last December, while overseas sales rose 9% to $305.9 million. Another weak spot was its antipsychotic Zyprexa, which lost patent protection in October 2011. Sales fell 10% to $348.2 million, due to a 35% drop in U.S. revenue and a 5% overseas decline. The only major market where Zyprexa remains under patent is Japan. Sales of Evista, a hormone treatment for osteoporosis in postmenopausal women, rose 14% year over year to $275.9 million, but sales are expected to slide after its U.S. patent expires in March 2014. Source: Eli Lilly annual reports. Declining sales of those three drugs will hurt, but investors should also note that Lilly's other major drugs, such as Cialis (erectile dysfunction), Forteo (osteoporosis), Humalog (insulin), and Strattera (ADHD) all posted double-digit sales gains last quarter. Together, these higher-growth drugs accounted for about 29% of Lilly's total 2013 revenue. The growth of those drugs, however, won't be enough to offset losses from generic Cymbalta, Zyprexa, and Evista. Eli Lilly investors are probably tired of hearing about its Alzheimer's efforts by now. Solanezumab, an injectable drug targeting the beta-amyloid brain plaques that were believed to cause the disease, performed poorly during phase 3 trials in August 2012. Another experimental oral drug known as a BACE inhibitor failed a phase 2 trial after patients developed liver problems last June. Finally, Amyvid, an imaging agent for Alzheimer's, was rejected for Medicare reimbursements for the majority of Alzheimer's patients last September. However, Lilly's dream of providing drugs to treat Alzheimer's remains alive. Although solanezumab showed poor phase 3 results in advanced Alzheimer's patients, Lilly moved ahead with three larger phase 3 trials of over 2,000 patients to test the drug on mild to moderate Alzheimer's cases. Of the three studies, the DIAN trial, which tests solanezumab along with Roche's Alzheimer's drug gantenerumab, will conclude in July 2014. EXPEDITION 3, which directly tests solanezumab against a placebo in mild Alzheimer's cases, will complete in December 2016. Lilly's third clinical trial, known as the A4 study, is expected to complete in April 2019. If there is any good news in the DIAN results in July, shares of Lilly should surge, since the drug was originally pegged to hit peak sales of $5 billion. However, investors should remember that other companies have long abandoned the beta-amyloid approach to treating Alzheimer's disease. Johnson & Johnson, Pfizer, and Elan (now part of Perrigo) notably abandoned bapineuzumab, which is similar to solanezumab, after a phase 3 failure on mild to moderate to cases in August 2012. J&J has given up on the hypothesis altogether and inked a new partnership with Evotec to explore small molecule treatments for Alzheimer's instead. Source: Company and industry websites. If approved this year, empagliflozin (co-developed by Eli Lilly and Boehringer Ingelheim) will be the third SGLT2 inhibitor to be approved in the U.S. after Johnson & Johnson's Invokana and AstraZeneca's Farxiga. SGLT2 inhibitors help diabetics excrete more glucose through the urine, possibly reducing the need for insulin injections throughout the day. Both Invokana and Farxiga are approved in the U.S. and Europe -- which means Lilly has a lot of catching up to do if it plans for empagliflozin to remain a relevant third choice. In addition, all three SGLT2 inhibitors still face scrutiny regarding possible liver damage and links to breast and bladder cancer. Meanwhile, if dulaglutide is approved this year, Lilly will finally have a viable competitor to Novo Nordisk's Victoza, a blockbuster GLP-1 drug that generated 3.23 billion kroner ($580 million) last quarter. GLP-1 inhibitors "trick" the pancreas into secreting insulin in a glucose-dependent manner. While GLP-1 inhibitors cannot replace insulin, they can reduce the number of daily insulin injections. AstraZeneca's Byetta and Bydureon (the same drug in two different doses) is Victoza's main competitor. Sanofi also has a rival GLP-1 inhibitor called Lyxumia, which is approved in Europe but not in the U.S.
Novo has ridden high on the success of Victoza to offset the FDA rejection of Tresiba, a long-acting insulin originally intended to compete against Sanofi's Lantus. Speaking of Lantus, Eli Lilly's LY2963016 (biosimilar/generic Lantus) represents a massive threat to Sanofi's top line when the blockbuster insulin loses its U.S. patent protection in February 2015. On January 31, Sanofi sued Eli Lilly for alleged patent infringements, which triggered an automatic 30-month stay of approval by the FDA. That delay could keep LY2963016 off the market until mid-2016, or until a court finds in favor of Lilly. Nonetheless, good news from any of these three treatments should have a positive effect on Lilly's stock price in the coming year. 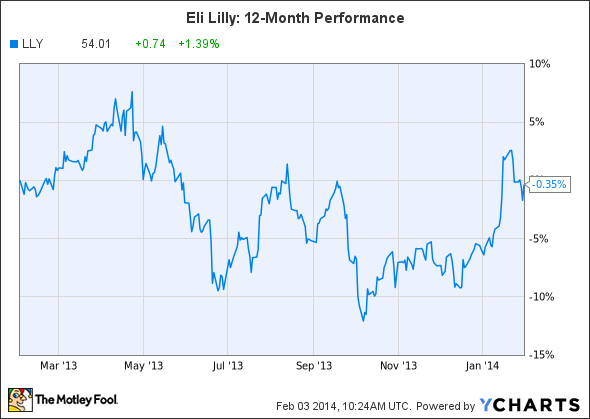 In conclusion, Eli Lilly isn't as weak as some investors believe. The company has aggressively cut costs with layoffs and pay freezes and rebuilt its pipeline to focus on new drugs. It also has a small but promising pipeline of cancer treatments, which include the treatments it gained from its $6.5 billion acquisition of ImClone Systems in 2008. Eli Lilly definitely has some major challenges ahead, and a lot could go wrong -- solanezumab could disappoint investors yet again in July, empagliflozin and dulaglutide might get rejected, and Sanofi might succeed at keeping biosimilar Lantus off the market until mid-2016. However, if Lilly manages to succeed, I don't expect the stock to stay flat in 2014 as it has in 2013.